My name is Kyle Pfaffe and my family have been Siena residents with you since May 2016. When choosing our next home, Siena stood out to my wife, Kimberly, and I as a community with nice amenities in a growing area and as a great location. My family enjoys walking our dogs or taking bike rides around the community and enjoying the outdoors at the Siena pools and playgrounds. In some of my spare time, I enjoy coaching my son’s football team and reading and our family is involved at our local church. 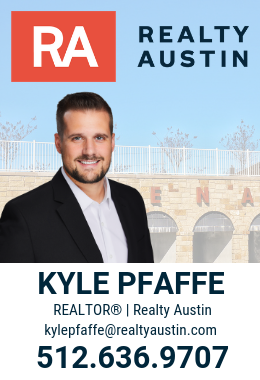 I work at a REALTOR with Realty Austin and, as a resident of Siena, I have a passion for helping people here in particular. Whether you’re considering purchasing a home and joining the neighborhood or you live here and have questions about the local real estate market, taxes or community news, contact me and I’d be honored to help.